Cyber Monday: My Takedown Maple-Candied Bacon and Spiced Pecan Nougat Is Now For Sale! 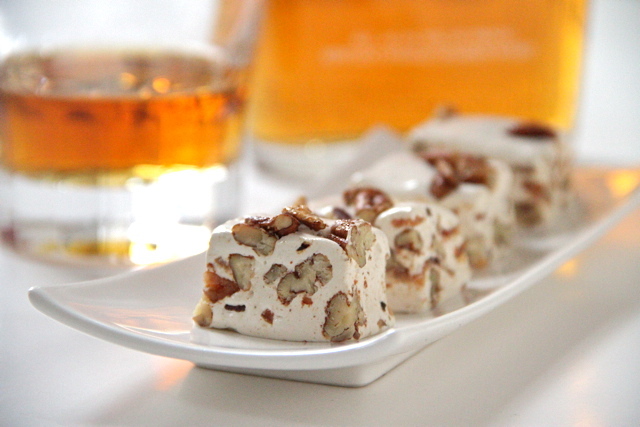 This addictive combination of maple sugar-candied bacon, Ancho chili and cayenne pepper-spiced pecans, and Bourbon nougat was created for the Brooklyn Bacon Takedown with the help of my downstairs neighbor, a professional candy maker. I posted the labor-intensive recipe here, but who has the time to candy, sit, stir, and wrap for hours? This season, give the gift that everyone loves. Give bacon! Order from Sweetniks.com or Sweetniks on Etsy here and here. * Photo courtesy of Sweetniks.com. No international shipping?! Hmmm . . . we got to work on that! PM me if you’re still interested! I’m more worried that they won’t get through customs! Mail has been infuriatingly slow lately. It took a little more than two weeks for a package of mine to go from New York to London. And two things I sent here in New York to New York (I know, incredibly lazy of me) have not arrived after more than a week. Ridiculous? Or is someone eating my packages?! I wouldn’t be surprised if someone was! Yeah. I had switched to this post office because the line was shorter . . . now I think I’m going back to my old post office. Worth every penny. I know! Aw, Mouse! You are so sweet! I will have another chance coming up for the Cookie Takedown. More deets to come! Thanks, Emmy! We are thinking throat lozenges. But good ones with real tea, real honey, and real lemon juice! Oh dear God in Heaven above I’m going to need to join another twelve step program to get off this stuff. Haha! No twelve steps for me! Bacon addiction? What bacon addiction?! I just clicked the Sweetniks “favorite” button on Etsy. All of the photos in that shop make me drool on my iPad. Everything is delicious. Her fleur de sel caramels are to die for! I still can’t believe that you lost with this recipe. Thank you, Karen! I was quite proud of them too. Good for you! The candy will generate revenue for your next run at the competition. If you’re interested, PM me and we’ll try to get a shipping price for you! This candied bacon sounds incredible!!! My kids are always making fun of me for liking odd food combinations but I bet they would enjoy this candy! I have been experimenting with different flavor combinations for the Cookie Takedown this weekend. Some are working, others not so much. However, I do enjoy playing around. Kind of like perfume: sometimes strange combinations work, but sometimes they don’t. But when they work, they can be amazing! You are seriously going to bankrupt me! I was perusing through some of the brands you recommended and the Stewart and Claire lip balms sound phenomenal…perfume for your lips….and I want them ALL 🙂 !!!!! Oh and I forgot to add…have you ever tried any of the products from Soap and Paper Factory? Wow! No, I haven’t heard of Soap and Paper Factory before but now I am going to seek them out! Thank you for the recommendation. They sound absolutely perfect for the winter when my hands get really chapped and dry. Thanks as well for the info about the the booths at Grand Central. I know that there are a bunch of holiday pop-ups over there and I am definitely going to go and check them out! It is probably too late for this year but you should inquire for next year regarding selling your food products….all the booths had products from local/artisanal businesses just like yours! And do try all of the Soap and Paper products- I was rushing to catch a train but I wish I could have lingered as I would have tried many more scents and bought so much more! The solid perfume I bought has low sillage but fantastic longevity (just like the hand creams). I mention this b/c I know you love perfume as well! Oh! I am responding to these out of order! Yes, we are planning on launching a booth this summer, either the New Amsterdam Market of the Hester Street Fair. Will definitely keep you in the loop. If you are around, you should drop by! Thanks for more info about the Soap and Paper products. Just looked at their site online. So much fun. Which solid did you get? Oh my gosh! That is hysterical! What a crazy site!! !